So we have the Super Bowl this Sunday, followed soon after by Mardi Gras. Calling all party planners! This Cajun-spiced chili serves up New Orleans in a bowl, which makes it perfect for both events. Best of all you, can make it a day or two ahead of time – because the flavor only improves as it rests in the fridge. All planning should be this easy. We call this recipe “Cajun-spiced,” but it could also be called “Creole-spiced” because of the tomato the dish contains. More about the distinction between Cajun and Creole cuisine in the Notes. 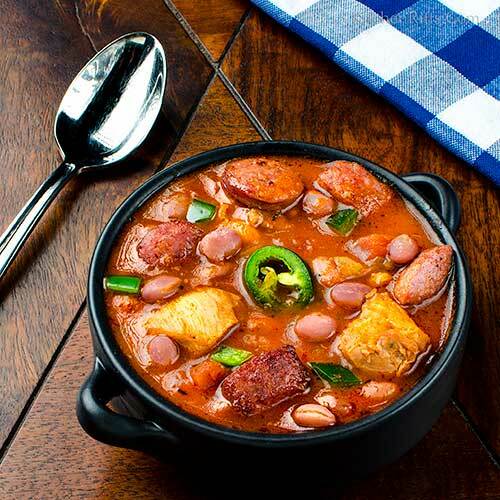 This recipe blends traditional chili with Cajun/Creole flavors. We use dried chile powder and Cajun spices, although you could substitute regular chili powder and Cajun seasoning (see Notes for an explanation of the differences). We like to make this dish with dried red beans, but you could easily substitute canned beans (again, see Notes). We use chunks of chicken, and prefer boneless thighs because they have more flavor and texture. But boneless breast meat would work, too. You could also try ground chicken (or turkey). Prep time for this recipe is about 30 minutes (plus at least 8 hours of soaking time if you’re using dried beans). Cooking time is 1½ to 2 hours, largely unattended. This recipe makes about 6 to 8 servings. It’s easy to double if you’re serving a crowd. Leftovers keep well for several days if refrigerated in an airtight container (in fact, the flavor improves). Or you could freeze the leftovers for up to two months. Soak the beans: Pick over the beans to remove any grit or dirt. Place the beans in a bowl and cover with several inches of water. Allow the beans to soak for at least 8 hours (preferably overnight). When ready to cook: Drain the beans and place them in a large cooking pot over medium stovetop heat. Add enough water to cover the beans by 1 inch (add more water during cooking if necessary). Set a timer for 1½ hours. Slice the chicken into chunks of 1 to 1½ inches, then sprinkle the pieces lightly with salt. Set aside. Cut the andouille sausage into rounds (or half rounds) about ¼-inch thick, or maybe a little larger. Set aside. Place a large frying pan on medium stovetop heat. Once the frying pan is heated, add the oil. When the oil is hot (about 15 seconds; it’ll shimmer), add the chicken chunks and brown them on all sides. Don’t overcrowd the pan; you may have to do this in batches. When the chunks are browned, set them aside on a plate lined with paper towels. Then brown the sausage pieces in the same oil (add more oil if necessary). Set the browned sausage pieces aside on a separate plate lined with paper towels. Meanwhile, peel the onion and cut it into dice of about ¼ inch. Set aside. Wash and core the bell pepper, then cut it into pieces of about ½ inch. Set aside. Wash and peel the celery, then cut it into dice of ¼ inch or so. Set aside. Wash the jalapeño pepper(s), cut off their stem ends, then cut them in half lengthwise. Use a teaspoon to scrape out the seeds and ribs. Be careful – the oil from these is hot, so avoid touching your eyes. Chop the peppers into small dice. Set aside. Then wash your hands with soap and water to remove the hot jalapeño oil from your skin. Peel the garlic and cut it into fine mince or thin slices. Set aside. By now, the chicken and sausage pieces should be browned and waiting (Step 5). Add the chopped onion, bell pepper, celery, and jalapeño pepper to the frying pan (add more oil if necessary). Season to taste with salt (about 1 teaspoon kosher salt for us, but see Notes). Sauté the mixture until the onion is translucent (5 to 8 minutes). Add the chopped garlic and sauté for 1 minute. Add the browned chicken and sausage pieces back to the frying pan, then add the chile powder and the spices (oregano, thyme, paprika, celery seeds, cumin, coriander, and cayenne). Stir to combine all the ingredients and sauté for an additional minute or two. Scrape the contents of the frying pan into the bean cooking pot. Add the tomato and hot sauce (if using). Continue cooking until the timer goes off. At that point, taste the chili and add more salt (and hot sauce) if needed. Check to make sure the beans are tender; if not, continue cooking until they are. Serve the chili with a garnish of jalapeño slices or dice (optional). We always put hot sauce on the table so people can add more heat if they desire. We often like to serve cornbread with chili. We sometimes add a pound of shrimp (peeled and deveined) to the chili. We add it to the cooking pot about 10 minutes before serving, so it doesn’t get overcooked. Shrimp makes the dish seem even more New Orleans to us. Want to use canned beans rather than dried? Use two 15-ounce cans. Drain them in a strainer or colander, then rinse off the gunk they’re stored in. Brown the chunked meat and sauté the veggies, then combine all the ingredients in a large cooking pot. Add 2 to 3 cups of water, then cook for 1 hour. BTW, if the chili isn’t as liquid as you’d like, add more water. What kind of chile powder to use? Ancho if you want something mild (most supermarkets carry this, so it’s easy to find). Dried chipotle chile powder if you want something hot. Or Hatch chile powder if you want something in between. Chile (with an e) powder consists of ground chilies. Chili (with an i) powder is a blend of chile powder plus other seasonings. If you don’t want to bother with chile powder in this recipe, you can substitute chili powder. The store-bought mixtures are usually pretty wimpy, so add 1½ tablespoons (or to taste). If you don’t want to measure out all the individual spices, you can use a Cajun/Creole seasoning powder. We like the Tony Chachere brand, but others are available. Use 1½ tablespoons (or to taste). Be aware that most commercial Cajun seasoning powders have a high sodium content, so adjust the salt accordingly. Speaking of salt, we use kosher salt in cooking. Because kosher flakes are larger than those of regular table salt, it’s less salty by volume. So if substituting regular table salt, start with about half of what we suggest. But always taste as you cook, and adjust the amount of salt to your own preference. If you’re doubling this recipe, we suggest using one 28-ounce can of crushed tomatoes and one can of diced tomatoes. If you want extra tomato flavor, add a small can of tomato paste. Add it to the sautéed veggies in Step 11, before you add the spices. Sauté it with the veggies for a couple of minutes, then add the spices. Tabasco and Crystal are probably the most popular brands of hot sauce in New Orleans. But use another brand if you prefer. What’s the difference between Cajun and Creole food? “Creole” refers to the original European settlers of Louisiana, especially those from France and Spain. Cajuns are descendants of people who moved to Louisiana from French-speaking Acadia (located in what are now the Canadian Maritimes). 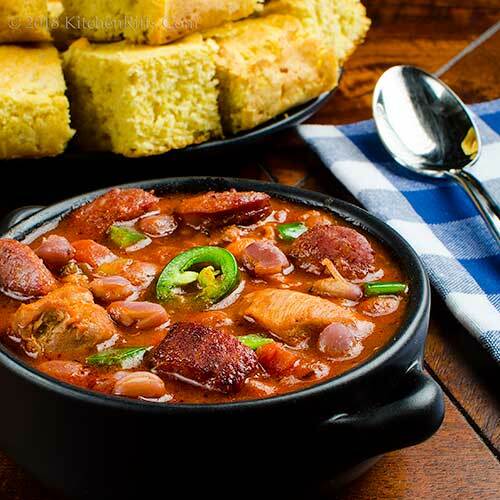 In general, Cajun food tends to be more rustic, while Creole food is more European-influenced. Tomatoes are much more common in Creole than in Cajun dishes (although both cuisines use them). Creole dishes tend to be fancier – which is why they’re commonly found on New Orleans restaurant menus. But the overall flavor of both cuisines is quite similar. “Should we dare to head down and collect some beads?” asked Mrs K R.
“So maybe we should stay in our warm family room and toss beads to Kitty Riffs?” said Mrs K R.
Guess you could call us responsible parties. It looks hearty, filling, and flavorful. I love the Cajun spices in there. What a coincidence, I just had a chat with my friend in New Orleans yesterday. Wow this looks like maybe the best chili ever. I would def add the shrimp. Last time I visited we went to Cajun country and I spoke to a few Cajuns in their French with my Quebec French, wow that was tough. Hi Pam, those spices are so good, aren't they? And they blend beautifully with traditional chili spices. :-) Thanks for the comment. Hi Evelyne, the shrimp is a fun addition! Neat that you got to speak French with some Cajuns. :-) Thanks for the comment. I don't cook with sausage much but it looks and sounds like I need to. This is super comforting! 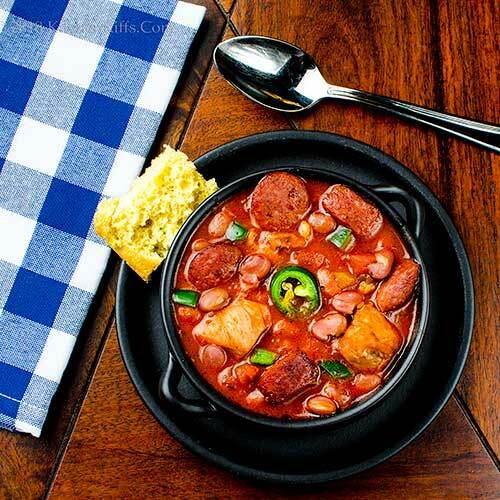 Hi Laura, andouille sausage has wonderful flavor! Full of spice and garlic. Good stuff. As is this chili. :-) Thanks for the comment. Cajun/Creole spices/flavoring are wonderful! I especially love the zing, since we eat a lot of spicy. Have fun! Spicy food like this is a great help on soggy or frigid winter days, with or without a sports event! Huge andouille fan here! It took a while, but we did find a place here in ABQ that makes a decent andouille and we buy it A LOT. This chili looks awesome and I love it that you used individual spices rather than a chili mix. The few times I make chili I use a mix. Maybe that's why I'm not a big chili fan. :) Your chicken-andouille chili has inspired me to give chili another try. Thanks John! Enjoy the super bowl! I love the spices in this dish though we don’t have andouille sausage. I will adapted your recipe with ingredients I can find here. We love chilli and grow and dry our own. Chicken chili is something I would LOVE to make right now but it's flipping 90 degrees outside, say what now?! I can't eat chili unless it's COLD! Hi Mimi, we eat a lot of spicy too. Good, huh? :-) Thanks for the comment. Hi Mae, yup, we need no excuse to have this! :-) Thanks for the comment. Hi MJ, chili powder is kinda blah and tastes too much like salt. Cajun powder has better flavor, but is also pretty salty. And I'll bet my spices are fresher than what's in the mixes. :-) Thanks for the comment. Hi Marcellina, a spicy sausage should work pretty well in this. Preferably something with a bit of garlic in it (or just add another clover or two of garlic to the recipe). Thanks for the comment. Hi GiGi, you can always turn down the thermostat on your AC. :-) Thanks for the comment. Food that improves as it sits is the BEST as far as I'm concerned. And chili is a must for the Super Bowl so this is a win in so many ways! Hi Kelsie, love to make things ahead of time! Makes entertaining much easier. And the food is usually tastier. :-) Thanks for the comment. I have so many beads! Totally love Mardi Gras recipes, but I have yet to make it to a Mardi Gras! Guess I'll just put on the beads! Can't wait to slurp this! Wow this must taste fantastic - and served with cornbread too - yum! Makes me want to have a party just so I have an excuse to make this. Love all the cajun spices! Hi Abbe, Mardi Gras beads are rather fun, aren't they? Can't wait to see how Kitty Riffs reacts to them. :D Thanks for the comment. Hi Carolyn, we're actually not into the game at all this year, but we're certainly into the food. ;-) Thanks for the comment. Hi Tricia, LOVE cornbread with chili. Or cornbread with anything. Or chili with anything. :-) Thanks for the comment. This is an amazing recipe. I would have never thought of adding Cajun seasonings to chili. I don't know why? My favorite--the celery seeds. It is a seasoning I love and now I want to try this. I've been wanting to make chili for a couple of weeks and now I have a new recipe to try. Thank you. Hi Rocquie, celery seeds are in so many Cajun dishes! Really add a lot of flavor. :-) Thanks for the comment. Looks so very flavourful, warming and delicious...now all I want is to dig into that bowl of goodness! Something that I would love to make for my family. We all love chili and the ingredients that are in it. Hi Angie, it IS a bowl of goodness. :-) Thanks for the comment. Hi Angie, bet they'll love the flavor! :-) Thanks for the comment. Hi Denise, chili is great, isn't it? Particularly during chilly weather! :-) Thanks for the comment. There are always so many Super Bowl food recipes! I always plan something that can be kept warm without ruining the food. 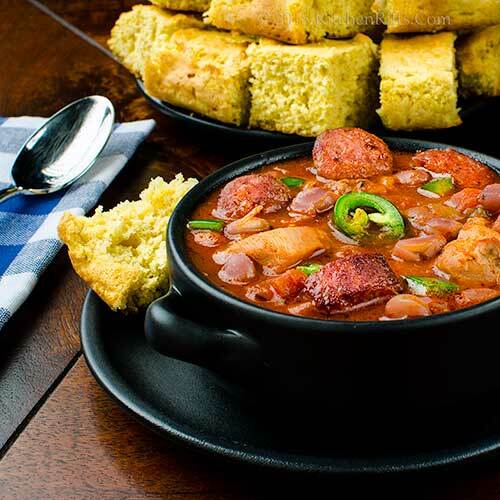 The Cajun-Spiced Chicken and Andouille Chili is such perfect recipe for this type of event. Packed with flavor and will hold until everyone wants to eat! Hi Deb, you can keep this warm almost forever (well, at least a really long time!) and it's still wonderful. :-) Thanks for the comment. I am definitely going to love this recipe because - Cajun spice !! The robust flavors will make this a great chilli any time of the year. Great idea for the super bowl party!! This has to be delicious, John!!! We haven't been to NOLA since Katrina but making this would be great with all those Cajun flavors, and good eating for this cold weather. Thanks for the recipe! Interesting! Now I know the difference between Creole and Cajun cooking.I also looked up the history of Mardi Gras in St Louis- I thought only New Orleans celebrated it- Wrong!! Hi Ansh, big flavor, big satisfaction in this dish. :-) Thanks for the comment. Hi Pam, it's gotten quite chilly here again today, so I'm craving this! Thanks for the comment. Hi Fran, St. Louis has a pretty big (and fun!) Mardi Gras celebration. :-) Thanks for the comment. This looks so delicious, you had me craving chili since your last post... lovely ideas John. Hi Amira, we seem to be ALWAYS craving chili around here! :-) Thanks for the comment. I'm so glad to hear there's a Kitty Riffs! This looks delicious, and I appreciate the details about the differences between Cajun and Creole. I always use individual chile powders. Oh, boy, this could be the best new idea for chili I've seen in eons! So much flavor in every spoonful. Perfect for half time!!! Hi Jean, Kitty Riffs rules our household! :-) Thanks for the comment. Hi Liz, this is just LOADED with flavor. Really. Good. Stuff. :-) Thanks for the comment. I love this, it's a great change-up on chili and I always love a recipe that gets better with time. I always have cornbread with chili too, it just feels like something is missing if I don't do cornbread. Hi Dahn, cornbread and chili is a wonderful combo, isn't it? :-) Thanks for the comment. Hi, I'm making this for a chili cook-off at our yacht club on Sunday and I will add the shrimp. How many does this recipe serve? This sounds delicious! I never use chicken in dishes like this and I really should give it a try! Hi Rene, with the shrimp this will safely serve 8, maybe a couple of more. But people will eat a lot of this, so if you're serving a crowd, I'd double it. Enjoy! :-) Thanks for the comment. Hi Caroline, chicken in chili is wonderful! Makes it a whole new dish. :-) Thanks for the comment. Real stick to your ribs game watching grub! Love the spices in here too! Going to give this recipe a try in the slow cooker. Thanks for a great recipe John! Hi Bobbi, I think this would be an excellent slow cooker recipe. I haven't made it that way, but have thought about it. :-) Thanks for the comment. We’ve finally decided to make a Moroccan-style vegetarian chili for Super Bowl this year but I’ll bookmark this recipe for next year. Thanks for the corn bread reminder, almost forgot that! Hi Eva, a Moroccan-style veggie chili sounds wonderful! I've made a lamb one (I need to post that one of these days) but veggie sounds even better. Thanks for the comment. Such wonderful flavors and what a lovely hearty meal that would be! Great soup for any celebration. Adding to my must make list. Happy weekend! Hi Taruna, the flavors in this are wonderful! :-) Thanks for the comment. Hi Debra, you'll love this -- so full of flavor! Thanks for the comment. Love this take on chili! I always love a chicken chili. It would be perfect for our weather today. I am making a double recipe - there are 11 contestants. Can't wait. Will let you know how it turned out. Hi Lisa, chicken chili is good. As is beef, pork, vegetarian . . . :D Thanks for the comment. Hi Greg, stupid jokes are the best! :-) Thanks for the comment. Love this chili. I could use a bowl of this right now, with the cold weather we are having. I really love using chicken in chili. Hi Dawn, chicken in chili is good stuff, isn't it? Add the andouille, and we're talking heaven. :-) Thanks for the comment. SO many fun occasions coming up and this chili sounds perfect for them all! Wow, so delicious, John! And great photo too! Now here's a chili I get I'd really enjoy. (The kind they make with ground beef never did float my boat.) And I totally agree about the thighs—they have so much more flavor! Now I just have to find myself some andouille sausage. Not too easy around here, in fact I don't know if I've ever tried it. Hi Ashley, this chili is good any time! Thanks for the coxmment. Hi LIz, this is truly good stuff. :-) Thanks for the comment. Hi Frank, andouille sausage is really good! You definitely need to source some. :-) Thanks for the comment. This chicken dish has my name written all over it! Just perfect! Hi Katerina, good stuff, huh? :-) Thanks for the comment. Hi Marcelle, this would be a good slow cooker recipe! :-) Thanks for the comment. Hi Amy, it IS downright awesome. :D Thanks for the comment. Hi Emma, it's always an education writing these posts, too. :-) Thanks for the comment. Love the zing on this dish! Hi Raymund, can't get enough zing! :-) Thanks for the comment. I'm not really a fan of the big game nor Mardi Gras, but I'd have a dish like this any day! Hi Jeff, in truth, we're not either -- of either. :-) But we're fans of this! Thanks of this.